Competence frameworks and standards are increasingly used by professions in the UK, driven by pressures for professional accountability and particularly by the trend towards assessing practice before fully-qualified status is granted. A review of forty UK frameworks undertaken in 2012 indicated that most are concerned primarily with the ability to undertake work activities to an appropriate standard, i.e. they reflect a predominantly external or activity-based approach to competence. The better frameworks recognise that competence standards cannot provide prescriptions for practice, reflecting the need for practitioners to act intelligently and ethically and to make judgements in complex and unpredictable situations; they also support valid, robust and consistent assessment, and are capable of being adapted into different practice contexts while remaining sufficiently precise. On balance they are moving away from the prescriptive, role-based approach of occupational competence standards and can be regarded as reflecting the broader idea of capability as much as competence. The overall standard of professional competence frameworks is however variable, with some being little more than adapted course curricula or simple lists of activities that rely on a high level of tacit agreement about what is needed in practice. 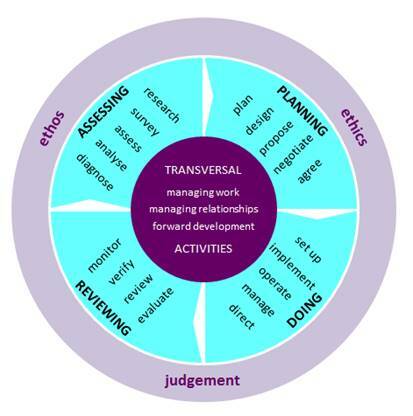 The ‘project’ of developing professional competence frameworks is a work-in-progress, with much to be learned from the best examples of the type. This research has been published in three papers. The first paper describes the basic research and puts forward a structural model for professional standards. The second paper develops on this theme and argues the need for professional standards to incorporate the broader notion of capability. The final paper argues that while an occupational perspective on competence is utilitarian and functional, a professional one is based on commitment to a particular set of values, resulting in essentially different approaches to competence standards and frameworks. An EU Erasmus+ project, ComProCom, drew on this research to develop a model of competence designed for complex work in professional occupations. Its outputs include a developer manual and an article discussing the principles underpinning the model. ► Competence standards and frameworks: some lessons from the UK (published 2015 in Polish Journal of Vocational Education). Two characteristics common to most professions are associating in some form of organisation, and acting to regulate themselves to a greater or lesser extent through entry requirements, standards of practice and processes for dealing with defaulting members. Not all professions approach these in the same way, and different histories, aims and operating contexts can lead to substantially different – and equally valid – approaches to association and regulation. This study examines how four small UK professions, accounting for approximately 12,000 members in total, associate and self-regulate. Landscape architecture, heritage conservation, family mediation and vocational rehabilitation differ in their history and stage of development as professions, how they organise as associations, and how and to what extent they act to regulate themselves. The case-study professions are considered in the context of wider trends affecting UK professions, and illustrate a variety of strategies for professionalisation and ongoing operation. The study is offered as a counterbalance to the dominance of large, established occupations in the literature on professions, and an antidote to assumptions that emerging professions need to emulate supposedly archetypal (but actually highly atypical) models such as those presented by medicine and law. Available from PARN as an e-publication. This occasional paper reports on a study carried out in 2008-9 to identify how professional bodies use and award higher-level designations such as Fellowship. 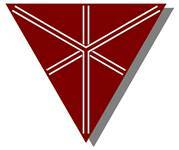 Four types of award or designation were encountered, with a trend towards designations based on a reasonably explicit level of achievement and awarded through transparent processes based on clear criteria. Overall trends suggest that advanced designations are moving away from the recognition of an elite, inner core of members and towards being a more widely-accessible marker that recognises achievement or contribution beyond that represented by the main qualifying grade. A major function of many professional bodies is awarding the qualified status or licence-to-practise for the occupation that they govern or represent. Requirements for becoming qualified vary between professions, as do the routes available to would-be practitioners to reach qualified level. This short book reports on research undertaken during the autumn of 2007 to investigate qualifying processes in a selection of UK-based professions. The book starts by outlining some of the main influences that can be expected to affect how professions qualify their members. It continues with a discussion of qualified status and professional recognition, then goes on to compare routes and requirements for becoming qualified and discuss how they are changing. 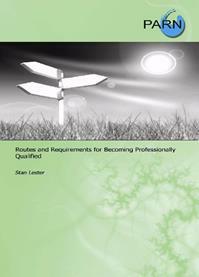 Further chapters examine the role of degrees and external qualifications, professional courses, and the practice-based aspects of qualifying. Links between professional qualifications, national qualification frameworks and occupational standards are also briefly explored. Qualifying requirements are becoming more rigorous, while the routes available for meeting them are increasing in flexibility. Many professions have made significant advances in recent years in among other things the assessment of professional practice and the widening-out of entry-routes, but there is still room for improvement in areas such as integrating theory and practice, developing more robust professional practising standards, making use of some of the more recent developments in higher education and supporting entrants through non-conventional or minority routes.